Carrie Haddad opened Warren Street Gallery on Hudson's Main Street back in 1991. She was not situated where she is now, at 622 Warren St, rather she was down the block working with 15 artists to launch a cooperative. Showcasing artists of the Hudson Valley, the gallery was an immediate success initiating Hudson's contemporary art scene. After one year, Haddad assumed full ownership of the gallery, solely curating the exhibits and her eponymous gallery was born. Expanding the roster of artists, she sought out emerging talent from the neighboring counties including the Capital Region. Twenty-five years later, approximately 100 represented artists work in mediums including painting, sculpture, photography and mixed media and are featured in 7 annual exhibits. "To have the ability to work in a creative environment with these artists year after year, to be engaged in how they see and interpret the world has been such an enriching experience. And they're gutsy! These artists really have to put themselves out there. I'm so proud to be a part of that and to introduce the work I love to wonderful people who want to buy it," says Haddad. "Happiness, for me, happens every time I visit an artist's studio." Nature dominates here in the Hudson Valley; it engages us wholly, influencing our emotions and physicality. The immersive experience is an optimistic one and the artists who work in this region are deeply affected by it. This Anniversary Exhibit will mark 25 years in Hudson opening May 25th – July 10th. Join us for a reception for the artists on Saturday, May 28th from 6-8pm. A resident of the Hudson Valley for more than 25 years, Leigh Palmer remains devoted to the countryside that serves as a source of meditation and challenge. Years of gazing out the window on his daily commute on Route 9G have added thousands of visual references to his mental encyclopedia. One cannot choose what will linger in the memory and what will fade away. Sometimes it's the general shape of a sloping field; sometimes it's the smallest detail of a broken fence. Other times it is, quite simply, a mood. When Palmer finds himself back in his studio, alone and quiet, he stands before a rectangular canvas like a puzzle that needs solving. Here, the process begins of recalling those memories, however detailed or vague. But what is worth keeping and what should be thrown away? Palmer says this part of creating never gets easier as you gain more experience or insight; it only becomes more challenging to have your voice remain relevant. His recent work has drastically evolved from his early days of painting hard edge realism in oil. Once he began experimenting with encaustic (wax based paint), he noticed a radical change in studio procedure, which yielded to the nature of the medium itself. In the Openings series, Palmer integrates the frame into the painting. This element contributes to the narrative, suggesting the viewer is inside looking out. We are not a part of the landscape, rather we are a peaceful witnesses to nature that will transcend even our own existence and continue to change with the seasons long after we have passed. We are romanced by Leigh Palmer's unique ability to pare down and find the true essence of the landscape, gently veiled through his own soul. We are proud to have exhibited his work since the inception of Carrie Haddad Gallery. Australian born sculptor, Leon Smith, will exhibit various small and mid-size sculpture. It was his first career as a dentist that taught him to make carvings and moldings. His sense of humor and that of his wife, Elaine, are at the epicenter of Smith's playful designs and titles. Riffing on simple, abstract shapes gives him the freedom to discover new forms and ideas. "The opposing qualities of form are what engage me most. Balance versus precariousness, stability versus movement, and the organic versus the inorganic. I'm partial to the double take, the paradox, but only if the work's formal qualities can sustain interest and delight over a long period of time". Smith's childlike energy knows no bounds, producing work that is at once amusing and sophisticated. Sure, he's 83 years old, but hold on tight when he drives you around in his golf cart! Touring the grounds of his studio and outdoor sculpture park in the Hudson Valley is no less thrilling than riding around with the Mad Hatter at Disneyland. (Please contact the gallery directly for information on tours). With the help of studio assistant and fabricator, John Brunese, many of Smith's spirited prototypes have been adapted for the outdoors. So while this exhibition will feature mostly small sculpture made of wood, steel, aluminum other material, take note that most are available in the 12 foot version. Carrie Haddad met the artist back in the late 90s and she admits, "I love Leon and his work just as much today as I did back then. You have to come see for yourself!" The building at 622 Warren is divided into 4 different exhibit spaces, the physicality of which allows us to merge themes, mediums and occasionally welcome a new artist to the mix. This has contributed to the dynamic and current nature of the exhibition schedule after 2 decades. 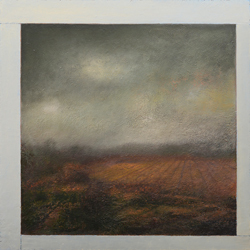 We are very excited to present contemporary color-field painter, Ginny Fox. The New York City native will exhibit a series of monochromatic multi-panel paintings that fuse the textures and colors of the natural world with linear and geometric patterns of industrial and architectural spaces. Fields of depth and light are built with multiple crosshatched layers of paint that is applied and removed with rags rather than a traditional brush. The closeness of the artist's hand is evident through Fox's flawlessly smooth surfaces that guide the viewers eye deep into her worlds of color. Fox is a graduate of New York University and has since exhibited extensively in Manhattan and the northeast. Dale Goffigon's photographs are largely informed by her extensive travels and preoccupation with architecture. Goffigon finds beauty in decay and a sense of order in isolated fragments; classical motifs and structures expose a feeling of imagined nostalgia for places not yet visited. An amusing series of Interiors photographed in both Italy and England reveal light sources that are fueled by the sun. Rays of sunlight penetrate windows and form shadows on furniture and everyday objects as though we are only now rediscovering artifacts untouched for centuries. Her deeply colored archival pigments are printed on beautiful, thick cotton rag paper and she shoots on a medium format Rolleiflex camera. Goffigon comes to us from Greenwich, CT. She studied photography at the Parsons School of Design and the International Center of Photography in New York.